Nearly 50 percent of older adults report using seven or more medications while remaining active drivers, according to new research from the AAA Foundation for Traffic Safety. Currently, a record 42 million adults aged 65 and older are driving, which is expected to increase substantially over the next decade and may make them the largest driving population. 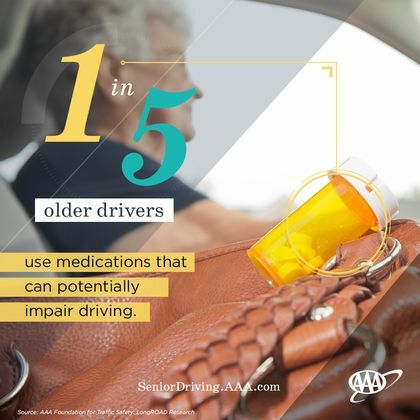 AAA encourages older drivers to ask their doctors and pharmacists as many questions as necessary to ensure they understand why they need the medications prescribed to them, and how they can affect their driving.